This article covers using storage accounts. We recommend that you use managed disks and managed images instead of a storage account. For more information, see Capture a managed image of a generalized VM in Azure. This article shows you how to use Azure PowerShell to create an image of a generalized Azure VM using a storage account. You can then use the image to create another VM. The image includes the OS disk and the data disks that are attached to the virtual machine. The image doesn't include the virtual network resources, so you need to set up those resources when you create the new VM. This section shows you how to generalize your Windows virtual machine for use as an image. Generalizing a VM removes all your personal account information, among other things, and prepares the machine to be used as an image. For details about Sysprep, see How to Use Sysprep: An Introduction. If you are uploading your VHD to Azure for the first time, make sure you have prepared your VM before running Sysprep. You can also generalize a Linux VM using sudo waagent -deprovision+user and then use PowerShell to capture the VM. For information about using the CLI to capture a VM, see How to generalize and capture a Linux virtual machine using the Azure CLI. Sign in to the Windows virtual machine. 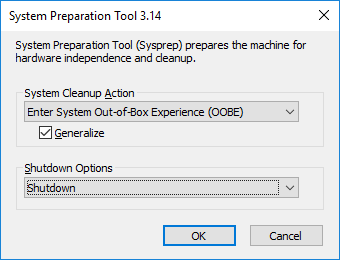 When Sysprep completes, it shuts down the virtual machine. Do not restart the VM until you are done uploading the VHD to Azure or creating an image from the VM. If the VM accidentally gets restarted, run Sysprep to generalize it again. Open Azure PowerShell and sign in to your Azure account. A pop-up window opens for you to enter your Azure account credentials. Get the subscription IDs for your available subscriptions. Set the correct subscription using the subscription ID. You cannot add, edit or remove tags from a VM once it is marked as generalized. If you want to add a tag to the VM, make sure you add the tags before marking it as generalized. Set the status of the virtual machine to Generalized. Check the status of the VM. The OSState/generalized section for the VM should have the DisplayStatus set to VM generalized. Create an unmanaged virtual machine image in the destination storage container using this command. The image is created in the same storage account as the original virtual machine. The -Path parameter saves a copy of the JSON template for the source VM to your local computer. The -DestinationContainerName parameter is the name of the container that you want to hold your images. If the container doesn't exist, it is created for you. You can get the URL of your image from the JSON file template. Go to the resources > storageProfile > osDisk > image > uri section for the complete path of your image. The URL of the image looks like: https://<storageAccountName>.blob.core.windows.net/system/Microsoft.Compute/Images/<imagesContainer>/<templatePrefix-osDisk>.xxxxxxxx-xxxx-xxxx-xxxx-xxxxxxxxxxxx.vhd. Now you can create one or more VMs from the unmanaged image. The URI for the VHD to use is in the format: https://mystorageaccount.blob.core.windows.net/mycontainer/MyVhdName.vhd. In this example the VHD named myVHD is in the storage account mystorageaccount in the container mycontainer. To be able to log in to your VM using RDP, you need to have a security rule that allows RDP access on port 3389. This example creates an NSG named myNsg that contains a rule called myRdpRule that allows RDP traffic over port 3389. For more information about NSGs, see Opening ports to a VM in Azure using PowerShell. Create a variable for the completed virtual network. The following PowerShell completes the virtual machine configurations and uses unmanaged image as the source for the new installation. # storage account name as "myStorageAccount"
# Name of the virtual machine. This example sets the VM name as "myVM". # Size of the virtual machine. This example creates "Standard_D2_v2" sized VM. # Computer name for the VM. This examples sets the computer name as "myComputer". # OS disk name as "myOsDisk"
# Assign a SKU name. This example sets the SKU name as "Standard_LRS"
# Premium_LRS - premium locally redundant storage. To manage your new virtual machine with Azure PowerShell, see Manage virtual machines using Azure Resource Manager and PowerShell.